Just thought I would send you a campcrafty picture – it’s been a rather long time in the making, but I finally finished my shave horse. It seems like forever since I did the Campcraft course back in April! Fellow campcrafter Susan generously provided most of the wood, and we worked together on cleaving the log and flattening the faces. Having flatted the log with the Small Forest Axe… I really appreciate how much benefit there would have been with the lapping axe! It’s going on my Christmas wish-list. I am already thinking about ‘shavehorse mark 2’, a bit longer and with some adjustable features to handle bigger and smaller components. Having a shavehorse will be useful for making another one! This entry was posted in Customer Posts on November 9, 2010 by Woodlore Team. 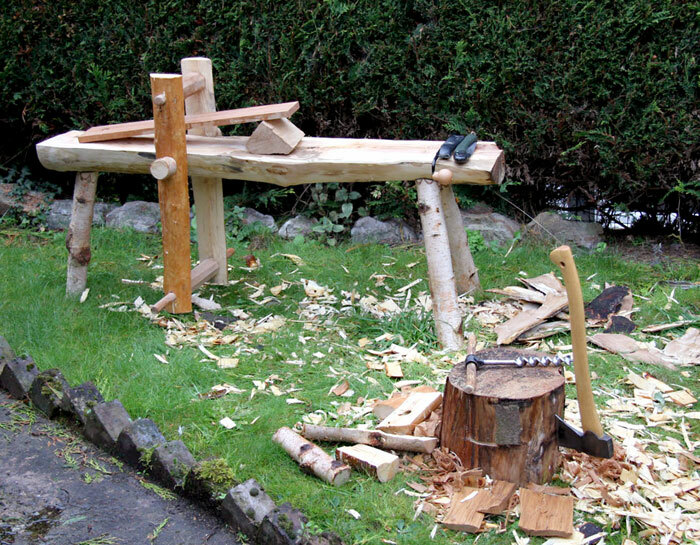 We had a little spare time on our woodcraft course a year or so ago and ended up building two of these. It was bloody hard work, but a real achievement seeing it all the way through, from living tree to final project. And pretty much all the work was only done with our axes. Its OK, I have researched about shave horses and now understand what theyre used for. Maybe you can shape next one to ad a seat on one end, making it more comfortable for prolonged use. Wow!! Well done, definitely something to aspire to. What is a shave horse and what is it used for?